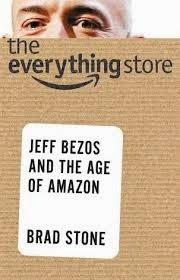 The Everything Store: Jeff Bezos and the Age of Amazon by Brad Stone was a thoroughly reported and well written look at Bezos and what the company he founded has done so far. Amazon is described in the book as a hugely challenging place to work at and Bezos someone who can be difficult to work for. That said, it was interesting to read of how Bezos would hire really smart people into the company and then find something for them to work on. Also fascinating to me about working at Amazon is per direction from Bezos, PowerPoint presentations are never done within the company. Instead six page narratives are written, with meetings beginning by everyone reading the narrative. The idea behind the narrative documents is both keep the focus on customers by having them be like a press release and to encourage employees to critically think through an idea. One interesting thing from the introduction to the book was a conversation between Bezos and Brad Stone with the author being asked how he'll handle the narrative fallacy, a concept written about by Nassim Nicholas Taleb, a noted statistician and writer who has decried the propensity people have for seeking simple explanations for complex events, when in reality there's often many factors, including those of the random variety. The response Stone wrote into the introduction was one that seems a good idea in many pursuits, in putting the book together given this narrative fallacy idea he wanted to "acknowledge it's potential influence and plunge ahead anyways." Another author that Stone referenced Bezos influenced by is Clayton Christensen who wrote The Innovator's Dilemma about how companies are afraid to threaten or cannibalize their existing markets, with The Everything Store referencing how brick and mortar companies like Barnes & Noble and Wal-Mart fell into this trap, contributing in large part to the success of Amazon. Also of note to me was how when Bezos would set low prices for products or services (as Amazon often manically does) it would be for a variety of reasons, ranging from simply providing the lowest customer price to putting pressure on a competitor and/or acquisition target to the fascinating to me idea of not pricing too high lest high margins bring in more competition. Overall, it was a fast read and interesting business book from Stone.